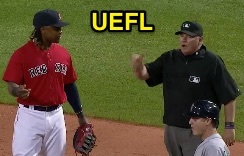 Official Business presents Hanley Ramirez, an avid Hunter...of Outs, a look at 1B Umpire Hunter Wendelstedt's appeal play in Boston on June 17. The following is commentary from Official Business CEO and former MiLB Umpire Brian Hertzog. Umpire & Analyst Brian Hertzog. I’ve been blessed to be able to see a lot of baseball, and see it from a pretty good seat. Do it long enough and you’ll see such a weird play that (any or all of) your partner(s) may simply tell you, “Don’t worry about it, it will never happen again…” Anyone who’s officiated knows exactly the type of play I mean, and a B-R missing 1st base on a ground ball within the infield certainly falls into that category for me. This is a play I thought I’d never see again, and I mean anywhere, most likely because I’d never seen it at all. Not in person on the field. Not on TV. Not from the stands. Nowhere, before I ended up umpiring the play myself. In the process of seeing this play out in real time, all I could draw on as an actual reference play was my memory during umpire school of Jim Evans’ story of this situation in Detroit with Ken Griffey, Jr running. Looking back at it, I suppose growing up in Seattle could have had something to do with my ears perking up at the right time for his war story. B1 Cruz runs past his base as the tag is missed. A batted ball grounded deep in the hole, an airmailed throw from the SS, Hanley Ramirez coming off 1st base to field it, Ramirez missing a swipe tag, Nelson Cruz missing 1st base, Ramirez following Cruz and tagging him, a subsequent “safe” call by Wendelstedt, a verbal appeal made by Ramirez to Wendelstedt as to why he was tagging Cruz, and lastly, a properly-officiated “out” call on the weirdest type of appeal play you’ll witness. Hunter's first mechanic is, properly, "safe." Speculation started immediately on the Seattle broadcast as to why Wendelstedt would call Cruz “safe” and then “out.” I yelled at them (which was only audible to my wife), buried my head and shook it a few times while I awaited another rule to be misinterpreted. My wife nodded along with me as I discounted their every statement; she’s taught herself to do so while never disengaging from her book. 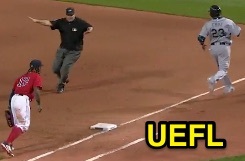 The analysis of the Seattle broadcast crew was that Wendelstedt had missed the play by ruling Cruz “safe” on the tag after being chased down, only to change it after checking with HP Umpire Jerry Layne. To rule Cruz “out” just after this tag occurred though would also be assuming that Ramirez wasn’t chasing Cruz having seen him round 1st base heading for 2nd, which we commonly see as a tactic. Yet another thought process can be based on a commonly held misinterpretation that tagging Cruz after missing 1st base would be an automatic out, having never fulfilled his obligation of touching 1st base and removing the force play on himself. Whether Ramirez continued to stand on 1st base after any “normal” play at 1st when the runner misses the base, or applied a tag beyond 1st after the missed base, this is still the same as any other base and needs a proper appeal. Hanley files his appeal and B1 is ruled out. Situation: R1, 2 out, base hit to RF. R1 misses 2nd base (force) and coasts into 3rd as B-R rounds 1st, then retreats. As the ball comes into the infield to the cutoff man, he fields the throw and steps on 2nd base as he jogs toward the pitcher. If we were to assume that R1 hasn’t fulfilled his obligation of touching the base he was forced to, this would be an out. It’s pretty clear that you can’t give the defense an out here though, as stepping on 2nd base could very likely have been inadvertent. Nothing changes simply because it’s a play at 1st base. In fact, nothing changes at any base other than a play at the plate. It needs a proper appeal. Whether you agree that Ramirez chasing down Cruz doesn’t yet qualify as a clear and unmistakable appeal, or you’re with the Seattle broadcast who subscribe to the theory that Wendelstedt didn’t see the initial miss of the base and looked to HP Jerry Layne for a visual cue, either situation requires a lot of patience, communication and proper timing. Brian Hertzog is the CEO of Official Business, dedicated to bridging the gap between Umpires and Coaching Staffs/Players by bringing an Umpire's unique knowledge of the game over to Player Development. Official-Business' goal is to bring an unparalleled level of respect into baseball by creating professional relationships between Coaching Staffs/Players and Umpires. 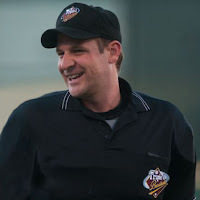 Hertzog is a 2006 graduate of the Jim Evans Academy of Professional Umpiring (JEAPU) and spent the 2006-14 seasons in Minor League Baseball's Pioneer, Arizona Extended, South Atlantic, California, Arizona Instructional, Texas and Pacific Coast Leagues, serving as Texas Lg Crew Chief in 2011, PCL Crew Chief in 2014, 2014 PCL Championship Series Crew Chief, and the plate umpire for the 2014 Triple-A National Championship.